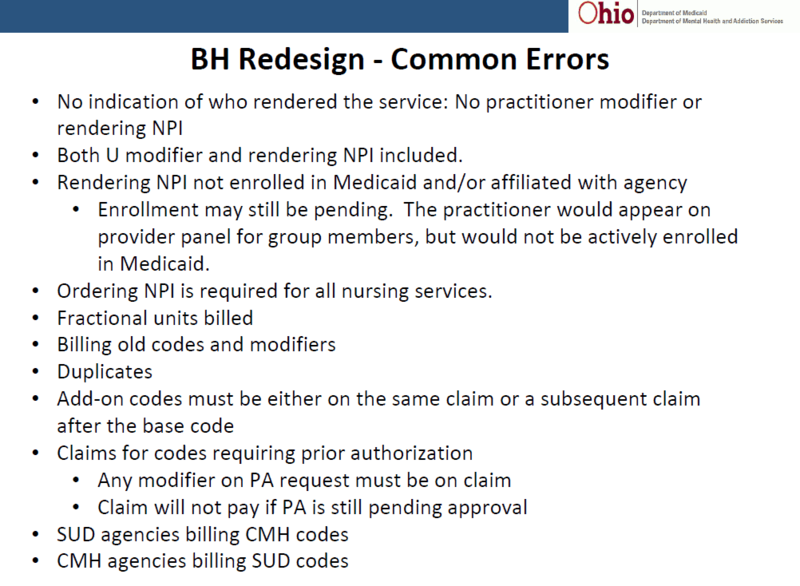 New Redesign info from Medicaid was released at the EDI Workgroup meeting on Wednesday, January 24th. Slide deck is available here. 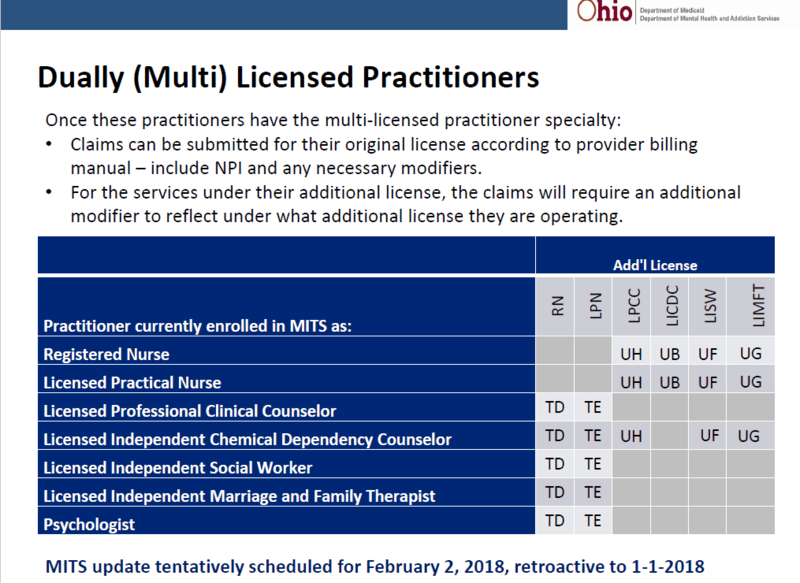 More information will be released on how exactly this will work but the basic’s are if you have independently licensed provider’s registered with Medicaid and they are dually, independently licensed, you will contact ODM and they will attach the second licensure to the original submitted NPI. No additional NPI or registration is needed. HOWEVER, the dual license providing services will need to need to utilize the modifier’s below. So yes, this will require an additional system build for some software programs. 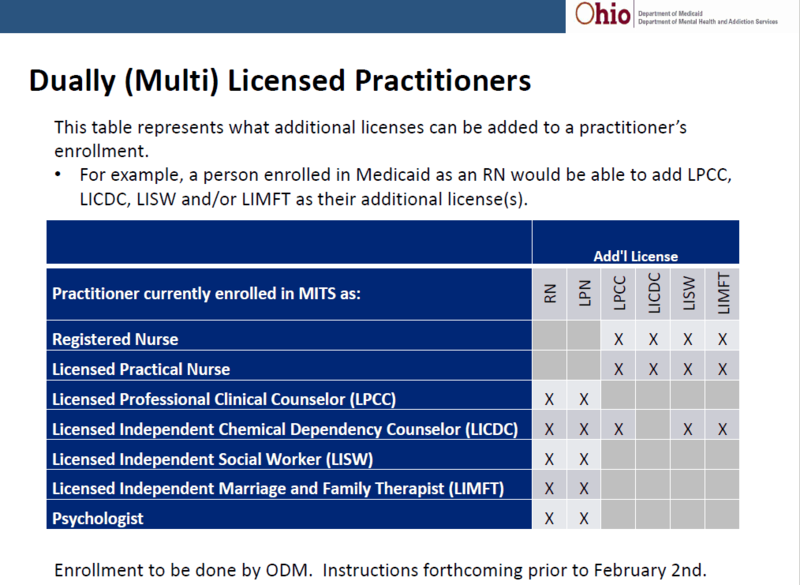 Essentially, one licensure must be set up as primary and the modifiers attached to the secondary license. Several questions arose from this disclosure. 1. Does this mean that each provider needing to registering will do twice the work to license both licensures? 2. How will this work when we need to accommodate dependently licensed and unlicensed providers? Both questions at this point are problematic and unanswered. “They will take these points back”. In addition, Medicaid provided examples of known issues that have been resolved. It’s important to note that the ability to include supervisor information on a HCPC claim does NOT mean you can bill at the higher supervisor rate. This was done simply to accommodate software programs that only have the ability to either include or not include supervisory NPI information. Medicaid also provided a new Most seen error report. One important thing to note is Medicaid now has the capability to accept an add-on code NOT on the same claim as the primary code. Essentially, they will backtrack and attempt to match it to an applicable code. However, you must have either the same NPI or provider modifier in order for this to work. 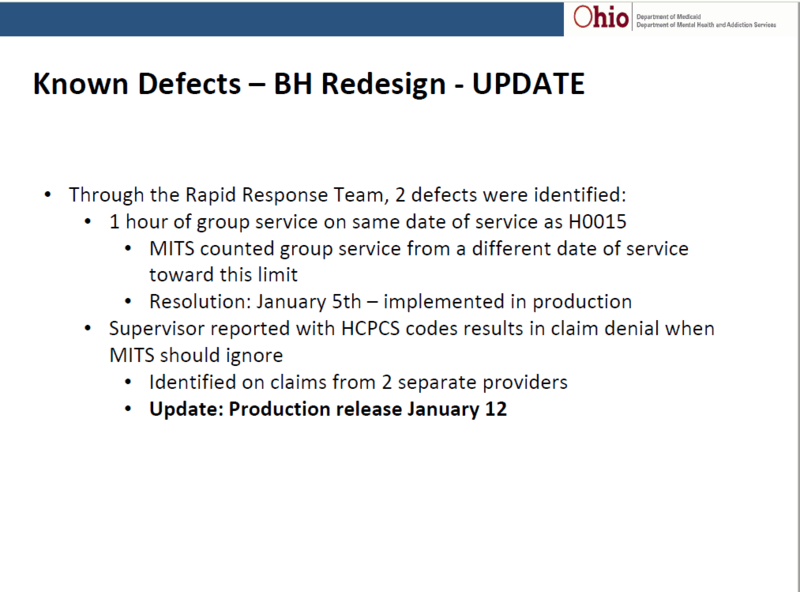 Also, at the EDI meeting, Medicaid refused to share information regarding claims sent post go-live of Redesign due to the fact that JMOC was meeting the following day and they didn’t want the information to clash or be represented differently. However, the only Redesign update I see on the JMOC meeting is below. How many claims have been sent EDI and how many are manual? How do these numbers compare to numbers paid by Medicaid in January 2017? What is the actual count of agency’s in Ohio that are unable to bill via EDI? How many LARGE agency’s (1,000 clients or more) are not represented in the amount of services billed to date post January 1? We know that 64 agency’s signed up for the Contigency plan payment which is 54% of revenue from 2016. Is Medicaid checking with each of these providers to verify their progress on ability to bill PRIOR to April 2018 when the payments end? In addition, keep an eye on your email. Registration for dependents and unlicensed providers is set to open soon if not already. And if you are an OTP provider, there are new requirements for billing effective 01/01/2018. Contact Medicaid for details. 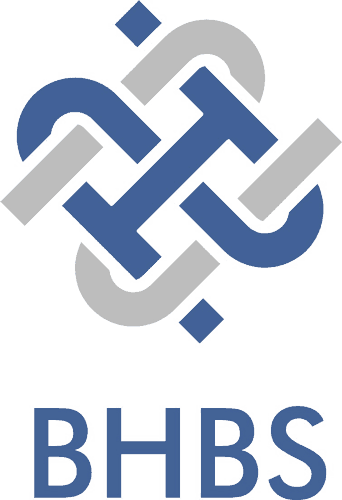 An NDC is now required on specific medications. Oddly, I have clients that are an OTP and I was unaware completely so I’m thinking if you are one, reach out to the executives that may have received that email. So as always, it’s good times billing Behavioral Health in Ohio. Use your resources. Feel free to contact BHBS at teresaheim@bhbillingsolutions.com and by all means, sign up with Ohio Council for Behavioral Health so they can advocate for your agency. They are fighting a battle for all of us.